What are Horse Racing Refunds? Horse racing refunds are a type of daily offer that the majority of major bookmakers run regularly for existing customers and thanks to Matched betting we can take advantage of these refund offers. The basic principle of horse racing refunds is that a bookmaker will offer the punter a 'refund' in the form of a free bet IF a certain event in the race happens. Because there is a chance that the refund doesn't occur, we must be aware that these kinds of offers are not risk free, however, if we can minimise the qualifying loss of the trigger bet these are definitely profitable in the long run! When To Complete Racing Refund Offers? As explained in the 'How To Make £100 To £1,000 Every Month' guide, I recommend firstly to profit from the Sports and Casino Offers to make up to £250 a month. To take your matched betting monthly up to the next level and make up to £500 per month, you can make an additional £250 per month on Saturdays by completing Football Accumulator Refund offers and Racing Refunds. In terms of Racing Refunds, Saturday is the best day because the bookmakers offer their best promotions on the ITV televised racing (formerly Channel 4 racing), which runs usually between 2pm to 4.30pm. You can place your bets either on Saturday morning or afternoon depending on which suits you best, except for the Bet365 offer which requires you use your free bet on the next race as explained below. Most major bookmakers run Racing Refund offers. Usually they have a maximum stake of £25. They vary in generousity, based on how likely you will receive a free bet. The exact % chances depend on the horse's odds and the size of the field, I cover this in the Estimator below. As you can see from the above % chance of refunds, the SkyBet, Bet365 and Betfair Sports offers are great. We have a 15%+ chance of a refund. The fourth and fifth types of offers are not so good, with only a 5% chance of a refund. To explain the 'Expected Profit' in the above table, using the SkyBet offer as an example, if I have a 30% chance of a £25 free bet, this has an 'expected' free bet value of £7.50 (30% * £25). If I convert this free bet to cash profit at 80% (using a high odds horse), this has an expected profit of £6 (80% * £7.50). Whereas if I have only a 5% chance of a free bet, then my 'expected' free bet value is only £1.25 (5% * £25). This means I only have an expected profit of £1 (80% * £1.25). Minimising The Trigger Bet Loss Is Key! The expected profit table above does not include your trigger bet loss. Your trigger bet loss from a £25 stake will be anything from 50p to £3. It is very important to minimise the trigger bet losses by finding the horses with the closest odds between the bookmaker and the exchange. For example, the 'Finish 2nd and Starting Price Favourite Wins' is worth only £1 expected profit. Therefore, if you made a £1.50 trigger bet loss, you would make a 50p net loss. To help you to find the horses with the lowest trigger bet loss, I highly recommend using the OddsMonkey Racing Matcher which does exactly this - as explained in the next section. To help you check the profits of each type of offer, I have built this Racing Refund Profit Estimator for you to use! The Estimator is for demonstration purposes, to help you see how different horse odds and different trigger bet losses will impact your net profit from each type of horse racing offer. Simply enter your horse odds (highlighted in blue) and your trigger bet loss (highlighted in red) and you can see the expected net profit in bold. I highly recommend using the OddsMonkey Racing Matcher. It is part of the OddsMonkey account which costs just £15/month with a 30 day money-back guarantee - a no brainer to give them a try! Step 1 Check with offers are available today in the OddsMonkey forum. 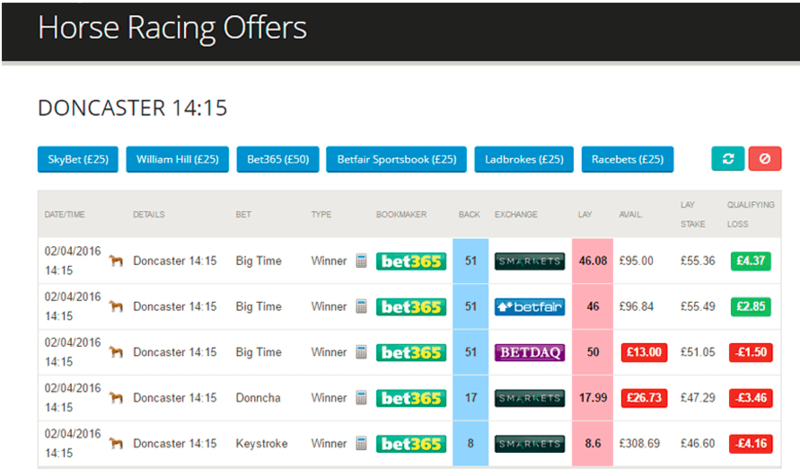 Step 2 Open the Racing Matcher for the offers you wish to complete. Step 3 Place your bookmaker bet, lay bet and hope your free bet refund comes in! I Am New To Horse Racing Offers, Which Offer First? I would recommend starting on a Saturday morning with the SkyBet offer. This is the most profitable offer and you can place any stake up to £25. If you feel comfortable, you could also try either or both of the Bet365 and Betfair Sportsbook offers. The more familiar you become, you can then add in Bet365 midweek offers and the 'Finishes 2nd' offers, there are typically one or two of these each day. How Much Do I Need In My Exchange(s)? You will typically be betting £25 on a horse with odds no greater than 5.0. This would require a liability of £100 in the exchange. For the Betfair offer, you will typically be betting £25 on a horse with odds no greater than 6.0. This would require a liability of £125. The free bet can be used within 48 hours. If you wanted to do multiple offers before the races start, then you would need the combined liability amount. For the Bet365 offer, if you are betting the full £50, you will need to have sufficient exchange funds for both your first bet and the second risk free bet (in case your first bet wins). Each bet would require a liability of approximately £250 if you were using odds of 6.0, so a minimum of £500 is required. Though you could start with smaller bet amounts whilst getting used to how the offer works. Horse Racing Festivals are consecutive midweek days at a particular horse racing track which attract a lot of attention. Often see excellent promotions running, it is well worth being familiar with Horse Racing Offers just to take advantage of these particular weeks! The same with mug betting on football, you should look to place an bet on a non-offer horse race. The OddsMonkey OddsMatcher is excellent for finding the lowest trigger bet losses so often this will only cost you 50p. I place a 1 or 2 £10 bets on horses on later races on Saturday on SkyBet. I use the OddsMonkey OddsMatcher to find the closest matches, typically these will only cost me 50p. I place a 25p acca on 5+ races too. If I am betting on say 3 races, I will place a mug bet on 2 non-offer races. Check our mug betting article for more details. Offers Forum Thread - Discuss today's horse racing offers, particularly useful for Saturday's when it can get up to 500 comments! Rule 4 Guide - How your bookmaker and exchange odds change if a horse withdraws after you have placed your bet. Non-Runner Notifications - Notifies you for non-runners if you would like to check the rule 4 impact. Oddsmonkey provide the above 'Racing Matcher' tool plus a full rounded service for those taking matched betting seriously. Including; Daily Offer Calendar, The Odds Matcher, The Each Way Matcher and full forum for the Oddsmonkey Community. 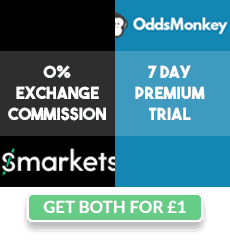 Oddsmonkey is only £15/month with a 30 day money-back guarantee, so if you don't enjoy it, it won't cost you a penny!